Mold is just about everywhere – it’s been on earth for millions of years! However, having mold or mildew growing under the tile in your home can lead to a number of health problems. That’s why timely water damage repair is important if your home has recently experienced leaks or flooding. Whether you’re looking to prevent mold and mildew or you’ve already experienced water damage, The Grout Medic has services you need to keep your home protected against mold and mildew. What Are Some of the Health Risks Associated with Mold and Mildew? According to the Center for Disease Control, there are a number of health problems associated with mold and mildew. Respiratory problems, itchy skin, and irritated eyes are just a few of the ways mold can impact your health. There is even some evidence suggesting that exposure to mold may cause asthma! For people already suffering from asthma, mold allergies, and lung disease, the risks can be even greater. If you’ve recently experienced flooding or leaking, prompt water damage repair is important for the health of you and your family. How Can Mold and Mildew Be Prevented? Mold and mildew grow in moist areas, so keeping your home dry and well-ventilated is key. There are many ways that mold can enter your home, but areas that are particularly susceptible to mold if they’re not properly maintained. In areas like bathrooms, however, there are lots of opportunities for water to sneak into walls and under floors. For instance, through dried out and peeling caulk. Caulk is used to seal the area between the walls and your shower or tub. It should be replaced every few years to ensure that the seal stays strong. When caulk gets old, it starts to dry out and peel away from surfaces, leaving plenty of opportunity for water to leak through and get trapped. Along these lines, loose tiles also give water an entryway into your walls and floor, making a perfect breeding ground for mold and mildew. 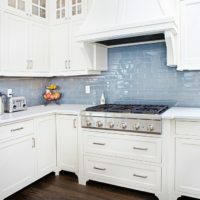 The Grout Medic offers the grout and tile repair services you need to ensure your bathroom, kitchen, and other areas are secure against these types of leaks. How Does Water Damage Repair Factor In? Whether you’ve been dealing with small issues like loose tiles and peeling caulk, or have recently experienced flooding, The Grout Medic offers a number of water damage repair services. We can assess your tile surfaces for any damage and can fix the problem before dangerous mold and mildew have the chance to form. We can even remove and replace the damaged areas behind your tile structures, ensuring that your home is healthy and safe. The longer you wait after sustaining water damage, however, the more likely it is that mold and mildew will have the chance to take hold. Contacting us as soon as possible is the best way to ensure that your home stays safe and free from these contaminants. Contact The Grout Medic today to set up an appointment for the water damage repair services you need!